The game was amazing and went into overtime. We had the lead for the first 2 quarters but just couldn't hold it in the end. The Marshall boys played hard and hopefully next year will be our year! 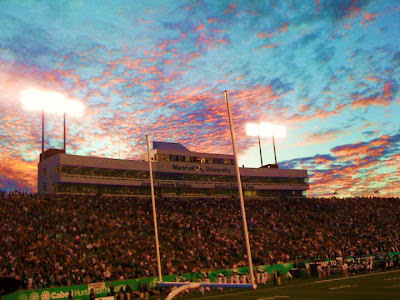 Go HERD! Jem! From Jem & the Holograms! 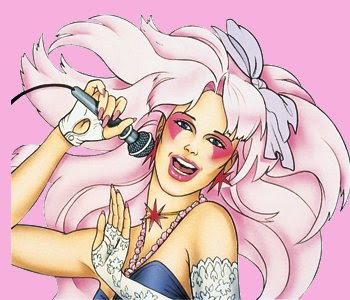 A friend of mine is going to go as Pizzazz who was the leader of Jem's rival band... The Misfits! I can't wait! It's going to be so much fun and anything that allows us to dress up 80's will be a hilarious. 3. Speaking of friends. The friend who will be going as Pizzazz, just started blogging! Her name is Erica and I've known her for years! We're from the same town, went to the same university and was even in the same sorority. 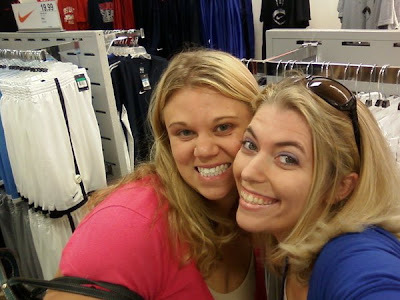 Over the years, we've always been friends and now she's living in South Carolina. So if you get a chance, go over and check out her blog! She's hilarious and I can't wait to see what she writes about. And hopefully, I'll see her in about 2 weeks down in SC!! 4. Besides doing yoga, I'm trying to get back into doing cardio workouts. However, I've been having a very hard time with the whole "Keep moving" attitude. I listen to my ipod to get me through it, Do any of you have some song recommendations? Nothing slow! Thanks! I loved Jem! Awesome idea. My current workout songs are Magic (by BOB and the guy from weezer) and that Eminem and Rihanna song but I'm getting really sick of it. And I did actually see the end of that football game. Pretty intense. Bummer about the loss...I think it's worse when it happens in overtime after such a close game! And Jem! Totally outrageous! :) I'm thinking about going as Flo, the Progressive lady for Halloween this year. SAD FACE for the MU game. I seriously got up from the couch and couldn't watch the last possession. It hurt too bad because I knew they would eff it up. As for cardio, I can NEVER go wrong with the Black Eyed Peas...they always keep me moving! I listen to a lot of Black Eyed Peas also. I also like Pink, The Killers and Lady Gaga. And Flo Rida always makes me want to move! Your costume is going to be awesome, I'm excited to see the pics! That picture in the stadium is gorgeous! And it is genious that you are going as Jem for Halloween! I only wish I'd thought of it first! Haha, you Halloween idea is classic. Can't believe it's Monday again. Hope it goes by fast for you. Psss... *whispers* ... I did watch the game and I was rooting for WVU, sorry! I always read when I do cardio machines so can't help you with music! I can't wait to see pictures of your costume!! JEM! Oh, awesome idea! My friend was Jem last year and her costume rocked! Sorry your team lost! I know they will win next time. Love your Halloween idea! I'm going to read thru the song recommendations because I need some too! Its never too early to start planning the Halloween costume! that seems like a fun costume!! You're pretty organized to think about Halloween already. I'm still getting used to it being Sept! But I like your choice of Jem!! That'll be a lot of fun. I love Jem! I used to download the songs on-line back in college, and definitely own the first 2 seasons on dvd. I definitely think it's time for Jem to make a comeback! Cardio has to be my least favorite part of working out. I make myself go to classes, otherwise I"d find a million reasons not to finish the hour. I went as Jem one year! Granted it was over a decade ago, but so much fun!!! That is a super great costume!